Ben was an excellent flyer on our recent trip to visit Lynn's folks in Connecticut. 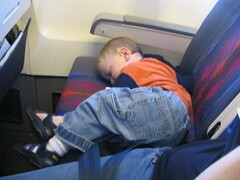 He fell asleep during takeoff (not in this position) from Chicago, and slept an hour. He then played nicely with a small set of toys for the next three hours. Go, Ben!